In multicomplex dynamics, the Tetrabrot is a 3D generalization of the Mandelbrot set. 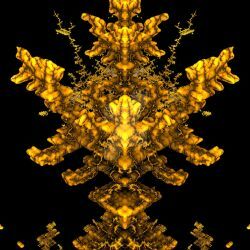 Discovered by Prof. Dominic Rochon in 2000 (Fractals, 8(4):355-368), it can be interpreted as a 3D slice of the 8D tricomplex Mandelbrot set. At first I thought the folder said Tarot Bot.